[April 09, 2007] Dolly Daugherty, 95, of Lincoln died Friday, April 6, 2007, at St. Clara's Manor. Her funeral will be at 1 p.m. Tuesday at Holland Barry and Bennett Funeral Home, with Marion Henderson of Lincoln Christian Church officiating. Visitation will be from 11 a.m. until 1 p.m. at the funeral home. Mrs. Daugherty worked at the Illiopolis War Plant for 2½ years and then at Stetson's China Factory in Lincoln for 12 years. She was born Dec. 3, 1910, near Mount Pulaski to Joe and Mattie Dodd Kingsley. She married Arthur Martin, and he preceded her in death. She then married Leon Daugherty, and he also preceded her in death. She is survived by seven grandsons, one granddaughter, two stepgrandsons and several nieces. A special thank you to niece Phillis Read and her husband, Lyle, and niece Wilma Dahmm and her husband, Wally, all of New Holland, for caring for Dolly. She was also preceded in death by four sisters, four brothers, an infant sibling, grandson Robbie Giles and great-granddaughter Lori Sullivan. 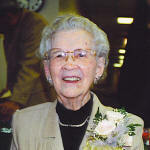 She was a member of Lincoln Christian Church and did church quilting for the Harvest of Talents. She played the harmonica and the spoons for the Oasis senior center for eight years. 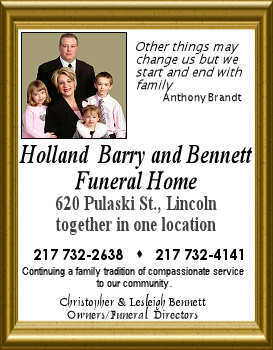 Memorials may be made to the family and will be accepted at the funeral home. Click here to send a note of condolence to the family of Dolly Daugherty.